One of the easiest ways Neil and I save money on groceries is planning our meals in advance and using leftover ingredients for multiple meals. When we made our Bun Thit Nuong (which we were able to nosh on for 2 days), we still had lots of veggies and herbs leftover. So rather than change gears and plan additional meals, we picked up a package of rice paper and decided to try our hand at spring rolls, something that has been on our “to-cook” list for some time. We also got a deal on the rice paper; a mere $.99 cents because no one had bothered to price it at the local grocery store. I’m pretty sure we got it for way less than we should have. 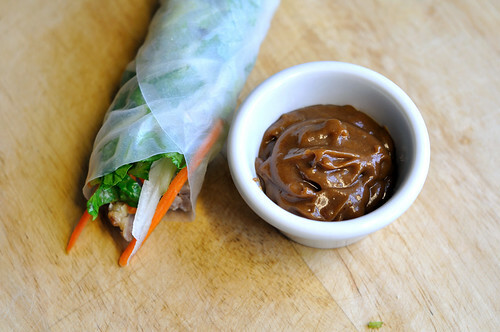 The dipping sauce is a really simple peanut sauce, made from peanut butter and hoisin sauce with a few extra spicy goodies a la Neil. 1. Prepare pork according to our method or your own. 2. 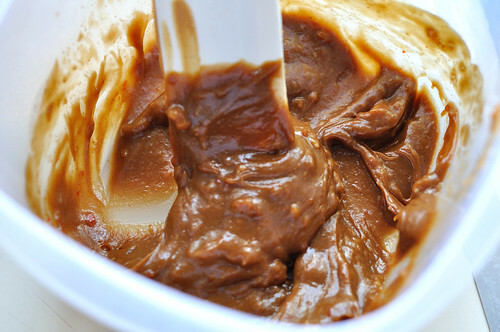 In blender, combine all ingredients for the peanut butter dipping sauce. Blend until everything combines smoothly together. If it is too thick or you prefer a thinner consistency, add hot water one teaspoon at a time. 3. Dip each rice paper wrapper in a bowl of warm water for about 3-4 seconds (up to 6 seconds depending on the thickness of your paper). DO NOT over soak! Once removed, place on a staging surface and allow to sit for 30 seconds to one minute. 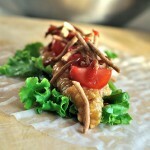 Your rice paper should be gelatinous but pliable. 4. On the side closest to you, add first a layer of lettuce and cilantro on the bottom. 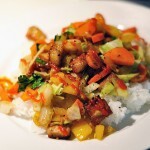 Then add cucumber and carrots and top with pork. 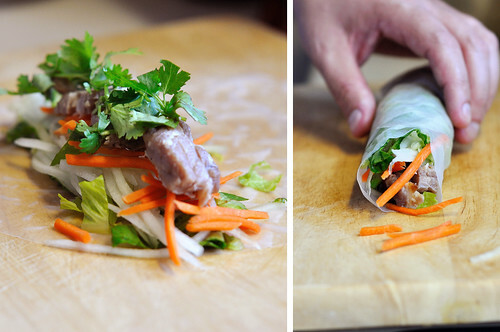 Lift side closest to you and begin rolling spring roll, about 1/3 of the way through, and fold in sides. Refrigerate as you assemble the rest of the rolls. 5. 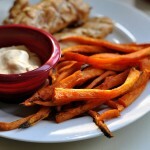 Serve with peanut butter dipping sauce and additional spices as preferred. by the end of the meal I was scooping the remaining sauce out of my bowl and eating it plain. Not much of a dip, as the spring rolls didn’t really feel like lending themselves to be dipped, so we spread it on the tops of each. These were so easy, I don’t know why we didn’t make them before. 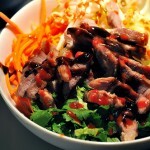 And just like with our Bun Thit Nuong, you feel good and full afterwards, but not a bacon double cheeseburger kind of full. More of a “I could still run in an hour or so” kind of full. We’ll definitely be making them again next week as we have plenty of paper left over. 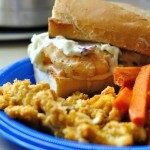 Maybe with shrimp? Ideas? 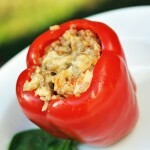 What foods currently top your “must try” list? Springs rolls are one of my favorite things to eat when we go out. I’ve never thought to make them before. I’m going to have to try this recipe. Thanks for sharing! These look amazing. I think I should add them to my menu next week. 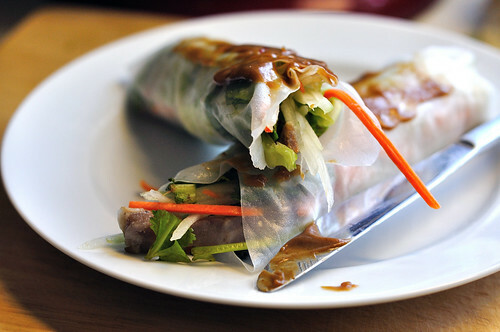 Oh gosh, I LOVE spring rolls but have never considered making them myself until seeing this. And that peanut sauce sounds divine!